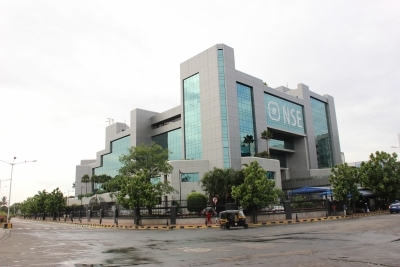 Mumbai April 16 (IANS) After largely bearish trade during the day the key Indian equity markets closed higher for the eight straight session on Monday as the wholesale price-indexed (WPI) inflation softened in March. According to official data released on Monday India s WPI inflation softened to 2.47 per cent in March from a rise of 2.48 per cent reported for February and an acceleration of 5.11 per cent in the corresponding month of last year. Market observers said that healthy buying in healthcare fast moving consumer goods (FMCG) and capital goods stocks supported the northward trajectory of key indices. At 3.30 p.m. the NSE Nifty50 provisionally closed at 10 528.35 points -- up 47.75 points or 0.46 per cent from its previous close. The barometer 30-scrip Sensitive Index (Sensex) of the BSE which opened at 33 944.73 points closed at 34 305.43 points (3.30 p.m.) -- up 112.78 points or 0.33 per cent from its previous session s close. The Sensex touched a high of 34 341.46 points and a low of 33 899.34 points during the intra-day trade. The BSE market breadth was however bearish with 1 430 declines and 1 232 advances. The major gainers on the BSE were Hero MotoCorp Kotak Mahindra Bank Adani Ports Mahindra and Mahindra and Bajaj Auto while Tata Motors Tata Motors (DVR) Infosys State Bank of India and ONGC were among the main losers. On the NSE the top gainers were Cipla Grasim Industries and Hero MotoCorp while the top losers were Tata Motors Infosys and Wipro.